July's employment report is expected to show a continued strong pace of jobs growth and the lowest unemployment rate since August 2008—good news for the economy, but possibly bad news for markets. Already markets are beginning to find dark clouds in what were once silver linings. Stocks fell sharply Thursday in part on the idea that an improving economy and pickup in inflation could push the Fed to raise interest rates more rapidly than expected. Economists expect to see 233,000 nonfarm payrolls and unemployment at 6 percent when the report is released at 8:30 a.m. EDT. That is down from the 288,000 jobs added in June and an unemployment rate of 6.1 percent. "If we really got a hot wage number and both the unemployment rate goes to a five handle, I think there's a possibility people will move up their rate hikes expectations by year-end," said James Paulsen, chief investment strategist at Wells Capital Markets. Hiring is expected to have been broad-based in June, with gains in services but also in construction, manufacturing and professional services. Data on Thursday revealed a pickup in wage pressures as the second quarter's employment cost index rose by 0.7 percent, the fastest pace in six years. That spooked markets, with bond yields initially jumping and stocks falling on concern it could speed up the Fed's rate hiking program. Stocks were also reacting to concerns about the European economy and banking system, and the potential ripples from Argentina's default. Art Cashin, director of floor operations at the NYSE for UBS, said Europe, which started the selloff Thursday, could end up being as important as the jobs report for Friday's markets. "Portugal's market lost the equivalent of 550 Dow points. We have to see what happens," he said. Cashin said the market will then focus on the jobs report, and if it is very strong it could cause a jump in rates that would rattle stocks. "If it's low, like 175,000, that would give the Fed more leeway," he said. Cashin said traders expect about 220,000 nonfarm payrolls. The jump in the employment cost index triggered concerns that the market would move ahead of the Fed's interest rate hikes, expected by economists to start in the middle or third quarter of next year. "The fear was the Fed would be behind and the vigilantes would take over," Cashin said. The central bank has been looking for wage growth, a sign that the economy is moving toward a higher level of employment but it also can be the early kindling for inflation. "I think wage pressures are starting to develop. I think it's nascent. I don't think it's an issue, but I do think we're starting to see wage pressure start to bubble up and this is the first real evidence of that," said Mark Zandi, chief economist at Moody's Analytics. The bump up in employment costs follows Wednesday's report of strong second-quarter GDP growth of 4 percent. That report included personal consumption data that showed a pickup in inflation. Read MoreWhy are markets down? Barclays economists expect to see 225,000 nonfarm payrolls and an unemployment rate of 6 percent. "It's outperforming our expectation," said Barclays economist Michael Gapen. "We did expect payroll growth to accelerate this year. We were looking for 200,000 a month. So far, for the first six months, we've been getting 230,000. 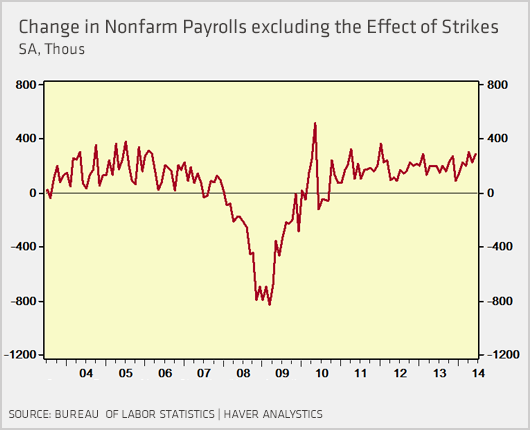 We do think the labor market's healing. They're healing in a way that is consistent with a return to modest wage growth." Consistently good job growth will help eliminate labor slack, something that Fed Chair Janet Yellen has been concerned about. The Fed, in its post meeting statement Wednesday, said it sees improvement in the job market but troubling factors remain, which would include a low participation level and long-term unemployment. Zandi estimates the slack amounts to 1.5 percent to 2 percent of the labor force, including those who are counted as unemployed, workers that have dropped out but want to get back in and those working part time for economic reasons. "If the pace of jobs growth we're at—the 225,000 per month is the underlying trend, suppose we just say the rate at which slack will be absorbed would be a pace of 0.6 or 0.7 percent per annum, That would suggest that we'll be at full employment by late 2016," he said. But he doesn't expect that to push the Fed to raise rates any sooner. "I think they're going to stick to the script. I think they want to see some wage growth before they pull the trigger and raise rates. I don't think this is going to force them to change," Zandi said. But Paulsen said the market dialogue has clearly changed. "You're going to be looking at how fast Yellen's slack unemployment rate is falling. They're no longer looking at the payroll numbers. They're looking at the inflation numbers. It's noticeable how the psyche has changed," he said. Analysts said the other factor for markets may be month end, and the question is whether buyers will come into the market for the new month Friday. Besides the jobs report, Friday's economic data include personal income and spending at 8:30 a.m.; consumer sentiment at 9:55 a.m.; ISM manufacturing data and construction spending at 10 a.m.; and vehicle sales throughout the day. There are also earnings from Chevron, Procter & Gamble, ArcelorMittal Axa, CBOE Holdings, Calpine and Weyerhaeuser. Berkshire Hathaway reports after the close.